pie | KBK Bakery's Adventures in Baking! I’m not feeling fantastic today, so it’s gonna be a short post… easy to put together, smells great, just came out of the oven. I coated the short crust with bittersweet chocolate and used black raspberry jam. 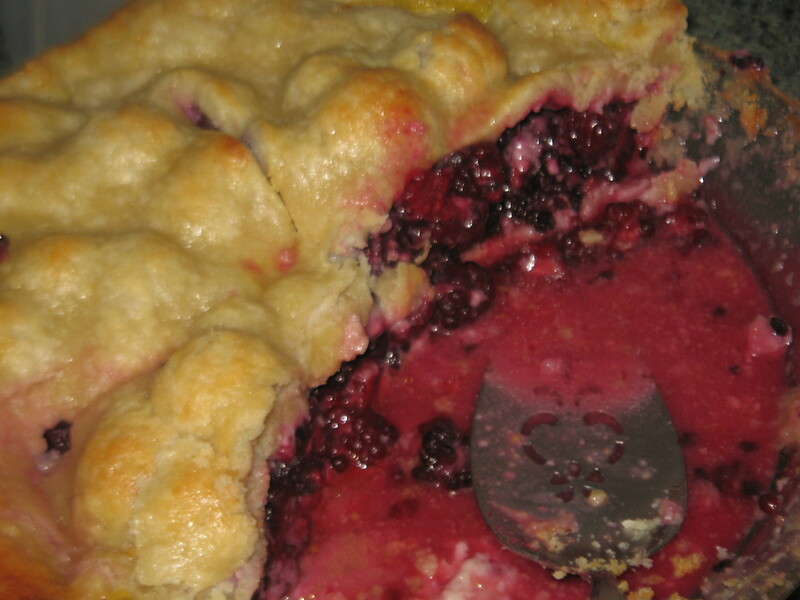 The frangipane was difficult to spread over the jam but it was just enough to cover. I’ll add pic’s of a piece once it’s cooled off a bit. Edit: Now… I must say, this tart was SO tasty. The chocolate added a touch of richness that just made the whole thing sing. 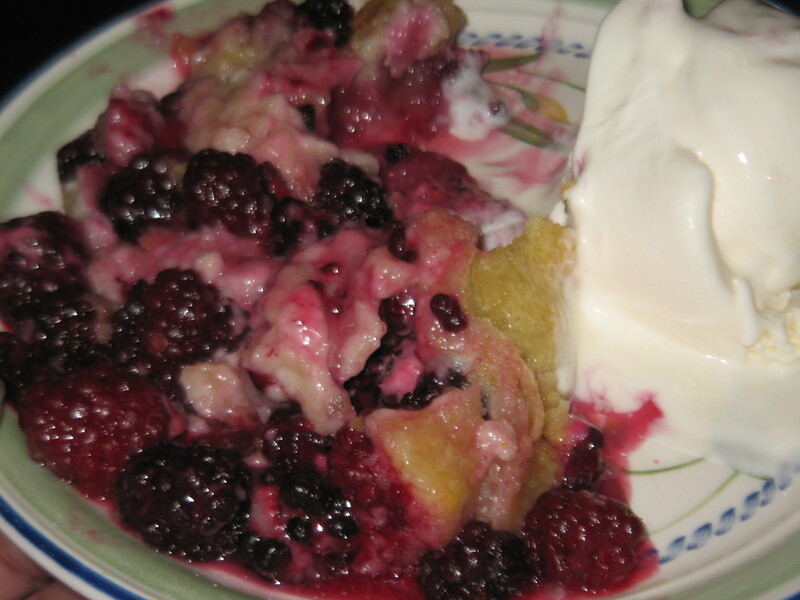 The frangipane was crisp and added some crunch to the tart. Ugh. So good. Yup, that’s it. Eggs. I completely forgot to add the 3 eggs. So what was supposed to be a poofy, cake-ish top, turned out a crispy, flaky (and damn tasty) crust. I encourage everyone to try it this way. It was super! I will definitely make this again to see how it was really supposed to turn out. I’ll let ya know! Place the chilled dough disc on a lightly floured surface. If it’s overly cold, you will need to let it become acclimatized for about 15 minutes before you roll it out. Flour the rolling pin and roll the pastry to 5mm (1/4”) thickness, by rolling in one direction only (start from the centre and roll away from you), and turning the disc a quarter turn after each roll. When the pastry is to the desired size and thickness, transfer it to the tart pan, press in and trim the excess dough. Patch any holes, fissures or tears with trimmed bits. Chill in the freezer for 15 minutes. Cream butter and sugar together for about a minute or until the mixture is primrose in colour and very fluffy. Scrape down the side of the bowl and add the eggs, one at a time, beating well after each addition. The batter may appear to curdle. In the words of Douglas Adams: Don’t panic. Really. It’ll be fine. After all three are in, pour in the almond extract and mix for about another 30 seconds and scrape down the sides again. With the beaters on, spoon in the ground nuts and the flour. Mix well. The mixture will be soft, keep its slightly curdled look (mostly from the almonds) and retain its pallid yellow color. Wow, but this pie was yummy! I’m not normally a coconut fan, but, once again, Dorie’s made a believer out of me. My coconut cream was nice and thick and had a chewy-ness that I really enjoyed. Everything came together very well. 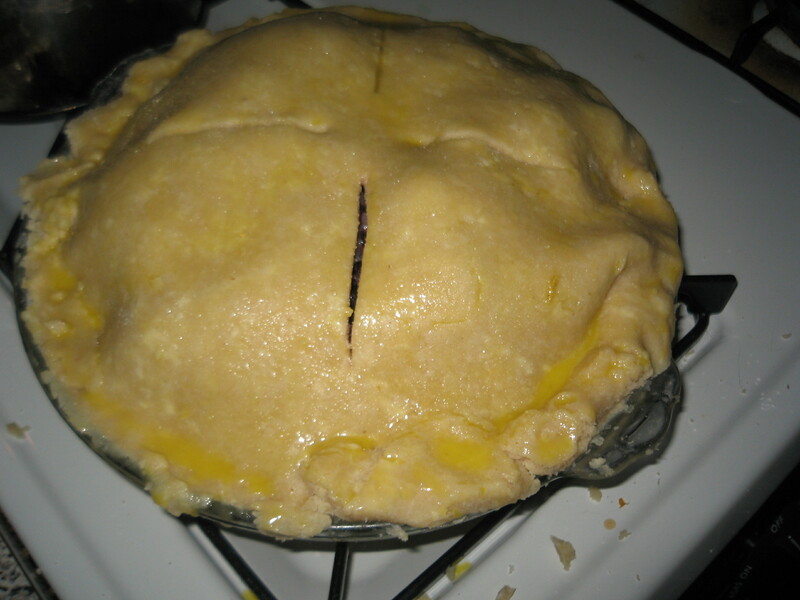 My crust on the other hand… well… It came out very pretty… and held together well… but… here is where I should mention that I was a little preoccupied and sleep deprived when I was starting this recipe. Ya see, my addled brain combined 2 lines of the recipe. Where it asks for 3 tablespoons of sugar and a pinch of salt? yeah. I got the 3 tablespoons and the salt part. And I even remember thinking “wow, that’s a lot of salt for one pie crust” but I scooped away anyhow. Of course, my brain soon slapped my conciousness silly and made me reread the recipe, at which point, I go “Oh, %^$&” and begin scooping salt back out of the mixture. Now common sense would say I should scrap the mix and start over or better yet follow Dorie’s advice and get a store bought crust. But no, I don’t have anymore crumbs and I don’t want to travel the great distance of a half a mile to go to the local Kroger. No no. I’ll just save this one. Well, suffice it to say that even though I managed to get, what looked like, most of the salt out, it was still a bit like eating a fantastic pie on top of a salt lick. Place the pie pan on a baking sheet. Bake for 10 minutes. Set the crust aside to cool on a rack while you make the filling. Center a rack in the oven and preheat the oven to 350°F. 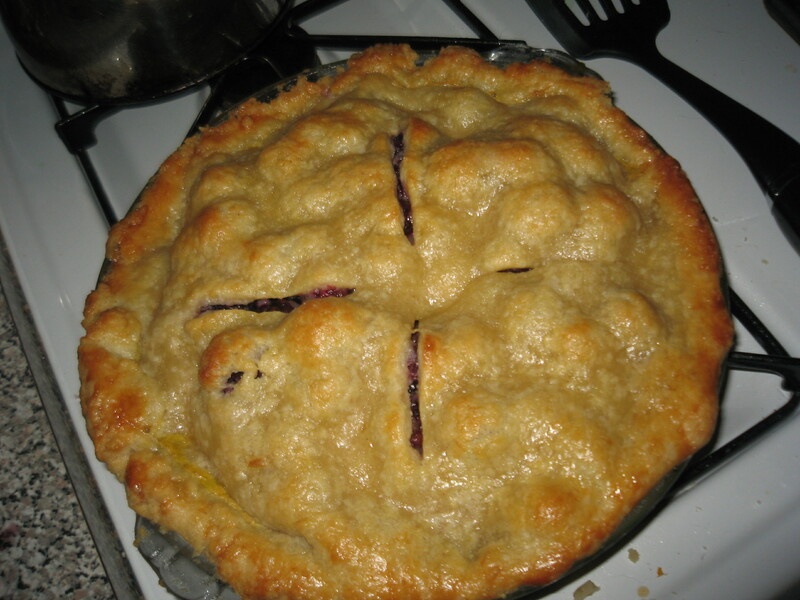 Put the pie plate on a baking sheet lined with parchment or a silicone mat. Working with a stand mixer, preferably fitted with a paddle attachment, beat the egg yolks at high speed until thick and pale. Reduce the mixer speed to low and beat in the condensed milk. Still on low, add half of the lime juice. When it is incorporated, add the remaining juice, again mixing until it is blended. 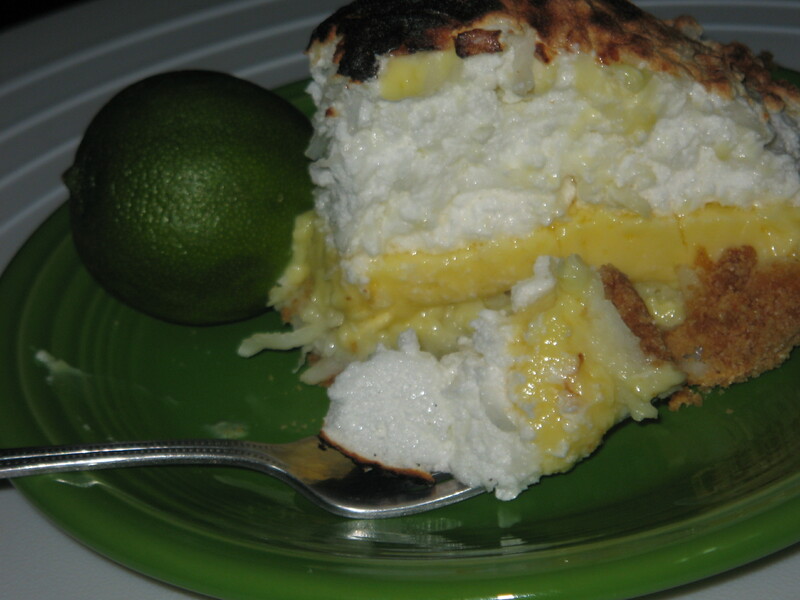 Spread the coconut cream in the bottom of the graham cracker crust, and pour over the lime filling. Put the 4 egg whites and the sugar in a medium heavy-bottomed saucepan and heat over medium-low heat, whisking all the while, until the whites are hot to the touch. Transfer the whites to a stand mixer, fitted with the whisk attachment, and beat the whites at high speed until they reach room temperature and hold firm peaks. Using a rubber spatula, fold the remaining 1/2 cup coconut into the meringue. Spread the meringue over the top of the pie, and run the pie under the broiler until the top of the meringue is golden brown. (Or, if you’ve got a blowtorch, you can use it to brown the meringue.) 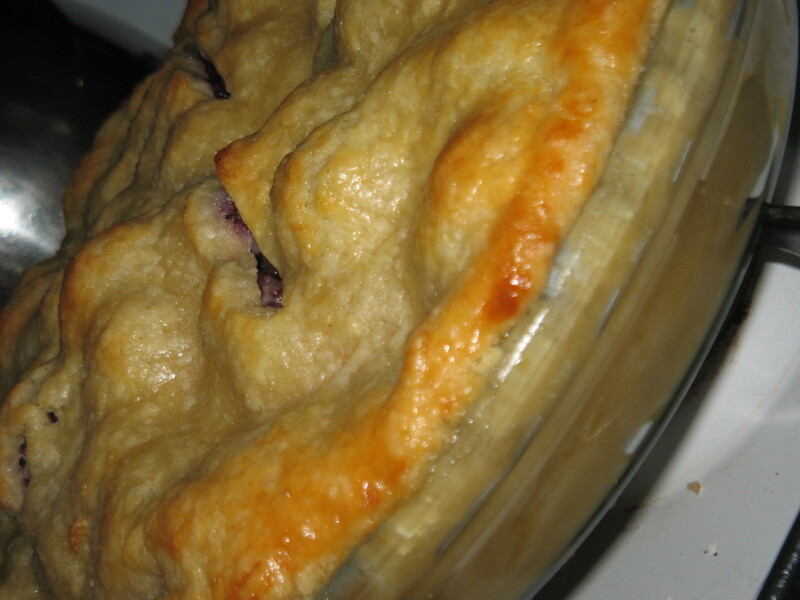 Return the pie to the freezer for another 30 minutes or for up to 3 hours before serving.